PLEASE NOTE: Doors now open at 7pm, with Cian Nugent on at 7.30pm, Jack Name on at 8.15pm and Ultimate Painting on at 9pm. The show is due to end at 10pm. We’re delighted to be bringing Ultimate Painting – featuring Jack from Mazes and James from Veronica Falls – back to Manchester! Ultimate Painting, the duo of James Hoare (Veronica Falls) and Jack Cooper (Mazes), release their sophomore album, Green Lanes, on 7 August via Trouble In Mind (Ty Segall, Mikal Cronin, Jacco Gardner). 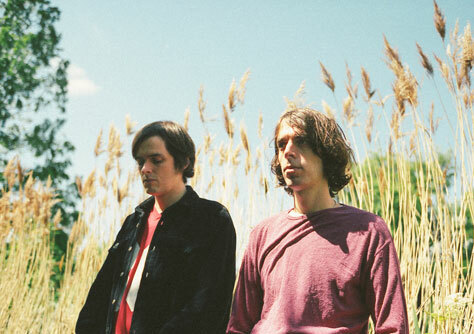 After touring North America and Europe with contemporaries such as Parquet Courts, Twerps and White Fence, Jack and James quickly retreated to James’ all-analogue home studio just off Green Lanes in North London to record the follow-up, joined this time by Mazes drummer Neil Robinson. Green Lanes is the follow-up to Ultimate Painting’s 2014 self-titled debut, also released on Trouble In Mind. Acclaimed by critics and peers, the LP felt like a breath of fresh air, with one eye on the orange haze of the late sixties and another looking optimistically to a sparse post-digital space. Refined and economic, dreamy and quietly euphoric, it’s ten songs by two songwriters at the top of their game. Main support comes from Jack Name. A collaborator with Ariel Pink, Cass McCombs and White Fence, Name’s music, according to Spin, ‘sounds like a fever dream of ’80s-pop radio, hooky and accessible but surreal and wildly disorienting’. Opening this excellent triple bill is Cian Nugent. Nugent is a guitar player and composer from Dublin, Ireland who combines personal passions, such as suburban/coastal blues, traditional musics, late 1960s and 1970s singer-songwriters, jazz ambitions, 20th Century composition and the Takoma school into a deeply personal style.